Are you moving to a new location and in need of a storage facility? With so many self-storage options out there to choose from in the Fort Worth and Dallas areas, how do you know what the differences are between the various facilities? More importantly, what questions should you ask to find out what storage rental is right for you? How does the company treat their customers? Take notes on how well you’ve been treated over the phone, via e-mail, or at the front desk when you visit. Companies that value their customers will be friendly, treat them with respect, and will answer all their questions thoroughly. In addition, check online reviews to learn about the experiences others have had with the company. Online reviews can be very valuable in giving potential customers a well-rounded view of how the company deals and interacts with the public. For many self-storage renters, price is one of the main concerns. Research prices and determine what amenities you need. Is boat or RV storage necessary, or do you need access to the facility at specific times of the day or evening? Be sure you know what you get for the price you’re paying. Getting quotes from at least three different companies is always a good idea. Making a move or going through any other major life-transition can be stressful, so making sure your self-storage unit is conveniently located is key. How close is the facility to your office or your new home? 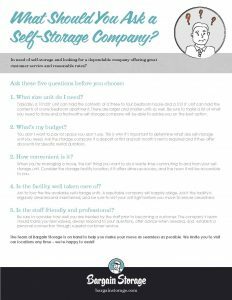 Finding a place that is easily accessible to visit, as often as necessary, is an important part of finding the right self-storage company for your specific situation. Before you set out to find the right self-storage company, know what size unit you’ll need. Do you need a smaller unit, or will you need more space to accommodate vehicles, large furniture, sports or camping gear, seasonal items, and more? Ask what units the company offers so you can be sure they have a unit available in the size that you need. How clean is the facility? Your personal items should be stored in a clean facility, as to avoid damage. Ask to tour the storage unit areas to be sure that they are clean and tidy. All units should be pest and rodent free and be swept regularly, as to avoid dirt buildup or pesky critter infestations. Ready to see what Bargain Storage has to offer? 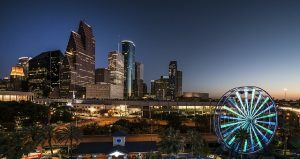 We have a variety of self-storage facilities that are conveniently located in Fort Worth, Dallas, and North Houston, in addition to other areas throughout the state of Texas. For self-storage in Dallas, visit our Oak Cliff or Desoto location. Each of our storage units are available at competitive prices and are run by our friendly and experienced team members at Bargain Storage. For more information on how a self-storage unit can make your move or life transition easier, contact us today!